Measuring predictive competitiveness of library managers from their narratives – a new approach | GM Info Consulting Kft. 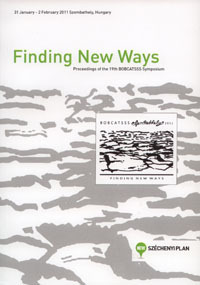 In: p. 230-237, Finding new ways : proceedings of the 19th BOBCATSSS Symposium. University of West Hungary Press, Sopron, 2011. Phase 2.: apply the findings in narratives of library managers (opinion leaders). As a background, it uses the methodology of the international GLOBE-project which assesses 9 cultural orientations. Some of them predict competitiveness within the countries and in organizations. The heads of organizations have a strong influence on their institutions, and their narrative contains the hidden patterns of human behavior, which forms the cultural orientations. This paper describes the way of identifying competitive cultural orientations within the narratives of the heads of organizations in the frame of four case studies. Based on this procedure, it also proves that the competitiveness analysis can also be used for the narratives of library opinion managers. Phase 1. The organizational culture is “shared motives, values, identities, and interpretations or meanings of significant events that result from common experiences of members of collectives and are transmitted across age generations”. (House et al. 2004) In the last 30 years, several scientists established their methodology for mapping the cultural orientations. The GLOBE-project (Global Leadership and Organizational Behavior Effectiveness) identifies different levels in nine cultural dimensions based on a questionnaire given to middle level managers of organizations (House et al, 2002) on the level of nations and organizations as well. and of power distance index and the in-group collectivism (being proud of the own group) negatively. This experience partly correlates, partly does not contradict the result of other methodologies. Figure 1. 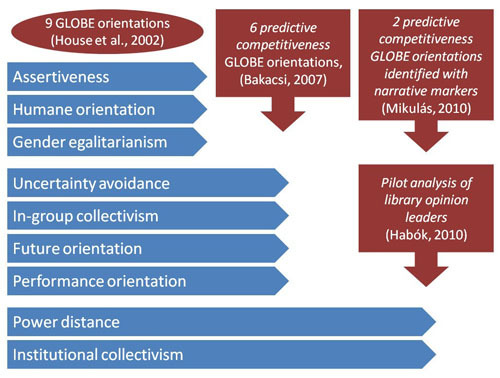 Among the 9 cultural orientations of GLOBE, 6 predictive to the competitiveness and 2 of them could be identified via narrative analysis. The definitions of these orientations are demonstrated in table 1. Power Distance (1) … is the degree to which members of an organization or society expect and agree that power should be stratified and concentrated at higher levels of an organization or government. (2)… is defined as the degree to which members of an organization or society expect and agree that power should be unequally shared. Uncertainty Avoidance (2) … is the extent to which members of an organization or society strive to avoid uncertainty by relying on established social norms, rituals, and bureaucratic practices. (2) … is defined as the extent to which members of an organization strive to avoid uncertainty by reliance on social norms, rituals, and bureaucratic practices to alleviate the unpredictability of future events. Institutional Collectivism (1) … is the degree to which organizational and societal institutional practices encourage and reward collective distribution of resources and collective actions. (2) … is the degree to which organizational and societal institutional norms and practices encourage and reward collective distribution of resources and collective actions. Performance orientation … is the degree to which an organization or society encourages and rewards group members for performance improvement and excellence. The questionnaire of the research asks about the experienced (as it is or descriptive) and the perceived (normative) state separated, referring both on national and organizational levels. In this way similar themes (should be or questions) were raised in 2×2 variations. According to the research relevant management science it can be assumed that due to the long distance refine the culture of the leader and the organization tends to become the same or very similar to each other. Also the literature search results let us presume that the competitiveness cultural orientations are the same on national (societal) and on organizational level. Phase 2. People discussed the organizational culture of librarians in several contexts. Based on Hofstede’s model, Pors and Johannsen (2003) indicated that in the Scandinavian libraries the power distance is small, the orientation to individualism is high, the feministic culture is characteristic and they deal with insecureness. Kaarst-Brown et al. (2004) found the most of the library-types to be identified as the same as the clan-culture. Mikulás (2005) empirically suggested by taking the model of Hofstede into consideration that Hungarian libraries have significant power distance, are highly collectivistic, feministic and avoid insecureness. Until now there hasn’t been literature about the GLOBE cultural orientations examined in connection with the librarians, as well as about the narrative identification based on that by Habók (2010). Phase 1. Aiming the identification of the patterns of cultural orientations in the narratives of head of organizations, the questionnaire of GLOBE was filled out by the middle managers of four organizations. All the organizations had some kind of experience with information processing, and had minimum 15 middle managers. With this questionnaire the cultural orientations of the organizations could be estimated with a quantitative method. The chief executives had a semi-structured interview with answers in four fields: 1 company history, 2 their own careers, 3 plans of the organization, 4 two examples of personal success and / or challenge. This text provided the corpus of the qualitative narrative analysis. Content analysis (qualitative) with two independent encoders with a third party judge. – Without having a comprehensive narrative cultural tool, an own methodological framework was developed. Motivation research (qualitative) – It was derived from the motivation system described by Kapitány and Kapitány (1993) in the texts. Additional analysis: measuring the appearance of some narrative themes, counting some phrases (quantitative), text pragmatics (qualitative). on the other hand, in triangulation with quantitative GLOBE-results, it could be specified: which cultural orientations can be identified with good effect with the use of narrative tools. The research is approached the competitive orientations from three (plus an additional analysis) directions. Correlation research included the GLOBE—content analysis, the GLOBE—motivation research and the content analysis—motivation research. Narrative patterns of power distance and institutional collectivism could be identified. Phase 2. Based on the findings of Phase 1., a new research is aimed at opinion leaders (managers) of Hungarian libraries who were in some sort of management position. After identifying the five main opinion leaders, 2×10 minutes unedited video samples – speech segments – of the target persons were transcribed in which the patterns of power distance and the institutional collectivism were searched (see Graph 1) by two independent encoders and a chief encoder. As a result, the codes of the two cultural orientations were quantified and the sample texts of library opinion leaders were ranked according to competitiveness. Phase 1. – Narratively identified predictive cultural orientations. does not experience high power distance on national level. Such a pattern – in comparison with the patterns of competitiveness specified by the research of Bakacsi – predicts lower competitiveness. Put simply: those who use the motives of power distance in their narratives a lot, intend to keep the power distance maintained, however this attitude let their own competitiveness decline. In the narratives of those, who speak about wider understanding and cooperation find them less important nowadays and in the future. They think a narrower perspective also in their wider community. Those, who speak about wider understanding and cooperation relating to their plans and future are interested in these also in their wider and narrower atmosphere. This result – comparing it to the pattern of competitiveness of Bakacsi – predicts lower competitiveness in the themes of past, and predicts an increased competitiveness in the themes of future. The conducted analyses (GLOBE, content analysis, motivation research add additional analysis) offered the possibility to give suggestions also to the inspected organizations of their organizational development. Phase 2. Based on the review and the comprehension of the five examined person’s transcribed video, the motive of power distance was to observe, however the institutional collectivism was common at each (see: Figure 2). The two orientations can be studied independently, as a possible base of coaching or organizational development. From the aspect of the competitiveness we can describe the case as significant, when there was no power distance or its value is lower than the institutional collectivism’s. Due to the nature of the case study of Phase 1., (small numbers of items) the results should be treated with caution, however, several well-known patterns from literature are drawn by them. Although the method is new and further tests shall be conducted on bigger narrative corpus, it seems to be a tool of evaluating also librarian manager’s attitude. As it has a significant impact on the institution they control, the competitiveness evaluation refers to the perspectives of the libraries, library organizations, associations and governmental bodies. 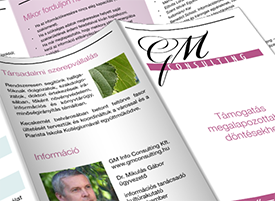 Organizational development within the consulting industry. The research refines the diagnosis of organizational cultural orientations which influence the competitiveness. The main instruments of this work are the questionnaires and the interviews. Both the questionnaire and the narrative data patterns promote the organizational diagnosis and make it more exact. Evaluation of personal narratives. Although the subject of the manager’s narrative shall be taken into account, the narrative samples may be a good base of identifying predictive competitiveness of library managers and the organizations they manage. Human resource consulting. Mapping the cultural orientations with interview method contributes the optimization of the working team combinations. It also promotes the proper suiting or pairing of persons and working tasks. Head hunting- and recruitment in general. The selection of the worker fits to the organization’s purposes and existing culture enhances the efficiency of the organization. The content analysis of the recruitment interview puts forward the selection of the person having a competitive culture fits to the aims of the organization. Credit rating process. The credit rating in the banks is expended by content analysis. If the applicant’s financial data and business plan and the content analysis of the applicant’s interview during the decision procedure show the same direction the security of crediting process increases. In case of controversial directions, further data analyses have to be involved. This enhances the security of credit rating process. Information consulting. The traditional company information may be completed by narrative analysis of the head of the company, with the emphasis on predictive competitive aspect. This possibly raises the value of the information service. Such an information package may contribute the selection of the proper subcontractor, business partner or predict the competitive potential of competitors in the future. Habók (2010) Magyar könyvtárak a sajtóban : Versenyképesség kimutatása könyvtári videókból : Szakdolgozat [Hungarian libraries in the press : Competitiveness from librarian videos : Graduation project] / Habók Lilla. – ELTE. – 68 p.
Kapitány—Kapitány (1993) Rejtjelek [Cyphers] / Kapitány Ágnes, Kapitány Gábor. – Szorobán : Budapest, 1993. – 247 p.